A night of Mojo Mambo music features a fresh mix of funk, blues, disco, Motown, rock, pop and swing. 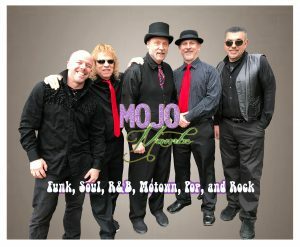 Mojo spans a wide range of music from the 70’s to today’s hits that is sure to entertain regardless of age and genre preference. Our song selection is also focused on getting peeps out of their seats to get them dancing and thirsty. We invite you to take a listen to what you expect to hear at a Mojo Mambo show..